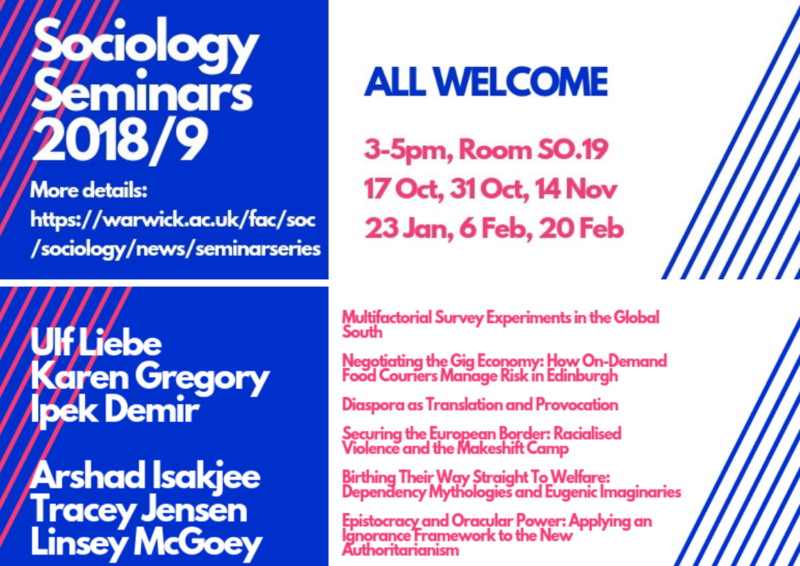 Sociology Departmental Seminars take place on Wednesdays in weeks 3, 5 and 7 during spring and autumn terms (see dates below). Download and print a poster for your door! 3-5pm in SO.19, followed by drinks and snacks. "Multifactorial Survey Experiments in the Global South"
Abstract: Many problems in so-called developing countries can only be solved by involving citizens and changing social norms in societies. It is therefore crucial to learn more about individuals’ beliefs, attitudes, preferences, and subjective norms. Yet, survey research on such issues has to deal with different forms of bias. For example, respondents might untruthfully answer survey questions in line with social norms, political rules, and in a way to please the researchers. Multifactorial survey experiments (MFSEs) can help to avoid such biases since they do not measure the concepts directly via single survey items but indirectly, based on the variation of different factors. They further single-out the importance of different factors and combinations thereof for evaluating social, economic or political problems. Therefore, MFSEs can contribute to solving social problems. In this seminar, I would like to talk and discuss about the potentials and pitfalls of conducting MFSEs in the Global South. "Negotiating the Gig Economy: How On-Demand Food Couriers Manage Risk in Edinburgh"
Abstract: Heeding calls for granularity and depth in gig or sharing economy research, this talk takes up the challenge to provide qualitative, local research into gig economy workers lives and work experience in Edinburgh, Scotland. Looking to the gendered, raced, and classed histories of delivery labour in the city, this talk draws from sociological theories of risk to articulate how one form of gig work (on-demand, app-based food delivery) produces a topology of long-standing and new risks, which workers must and do negotiate both personally and collectively. Straying from the mainstreams critiques of the gig economy as “good” or “bad” for workers, this research, which is drawn from in-depth interviews with on-demand food couriers, illustrates how local conditions, ranging from weather, geography, cycling histories, and unionisation histories, shape how workers adapt to and successfully or unsuccessfully negotiate gig work. "Diaspora as Translation and Provocation"
Abstract: My paper will critically evaluate the well-rehearsed ‘here/there/nowhere’ types of understandings of diasporic identities and instead examine how and why diaspora should be seen as a provocation – that diasporas settle the orders in the new home and back at home, but also globally. I will argue that diaspora should thus be understood in relation to the contemporary global order, and especially in relation to central frictions of our time, and thus bring diaspora in conversation with the literature on race, ethnicity, multiculturalism, cosmopolitanism, the global south and the recent upsurge in white nationalism. My paper will then attempt to think though diaspora via the notion of translation, especially by employing concepts such as foreignization, diaspora as rewriting, and erasure. "Securing the European Border: Racialised Violence and the Makeshift Camp"
Scholars interrogating European border policy over the last decade have been cataloguing harms perpetrated on migrants crossing into Europe and the European Union (Jones 2017, Collyer 2010). These include not only the overt physical violence of border enforcement inside and outside the EU, but also the structural violence which curtails rights to movement of migrants (Mountz and Loyd 2014), the violence of inaction that sees migrants left to drown in the Mediterranean sea when they could otherwise be saved (Squire 2017, De Genova 2017) and the withholding of provisions that sustain and protect life and dignity, in a calculated attempt to push these racialised ‘others’ away from Europe (Davies et al 2017). Concurrently, often counter to the prevailing political winds, everyday resistance, activism, search and rescue services (Pallister-Wilkins 2017) continue to assist migrants in the process of crossing borders, with provisions of food and resources for shelter. Drawing upon research conducted in Northern France (Dhesi et al 2018) and the Balkans, this presentation examines the technologies of violence that sustain the European border, as well as the racial logics that underpin them. It concludes by raising questions about the possibilities of resistance, refusal and resilience in the face of structured subjectification and oppression. "Birthing the Way Straight to Welfare: Dependency Mythologies and Eugenic Imaginaries"
"Epistocracy and Oracular Power: Applying an Ignorance Framework to the New Authoritarianism"
The resurgence of ‘strongman’ leaders in many nations is raising deep concern about the survival of democratic systems of governance. But the emphasis on ‘strong’ rule displaces attention to a separate line of attack on democratic governance: the rise of libertarian political theorists who explicitly champion neo-Platonian notions of elite rule by experts. In this paper, I explore the notion of ‘epistocracy,’ or ‘rule by knowers’, a phrase coined recently to defend and proselytize the purported advantages of explicitly anti-egalitarian systems of political rule. I argue that the concept of epistocracy rests on naïve epistemological assumptions which misunderstand the relationality of knowledge and ignorance, erroneously presuming that increased knowledge inevitably eradicates ignorance when the opposite is often the case. Building on this point, I further suggest that the concept of epistocracy can be better defined as ‘rule by unknowers’: systems of political governance that are strengthened by and reliant on ‘elite ignorance,’ which I define as the superior use of strategic ignorance to achieve both stated and unstated political goals. What is race doing in the UK's stem cell inventory?